I don't know if it's because I've been touched with the spirit of the holidays, or if I am just downright crazy, but a few days ago I got this so-called "brilliant" idea to make each and every single one of the Munchkin's friends from preschool a little gift. A little something-something for Christmas. A little token of appreciation of how much their interaction with my son has changed him so much in the 3 short months that he's known them. It had all started with a little stocking stuffer that I had made the Munchkin last week. Then I made 3 teacher appreciation gifts. I had shown them to the Munchkin, all packaged up in a very Pinterest-y way (and in my sleep-deprived state I realize that I've totally forgotten to take photos). The Munchkin asked if the gifts were for some of his friends. I replied no, but I could make his friends a little present. Then he asked if I had a present for his female friend. No, but I guess I could make something for her to. 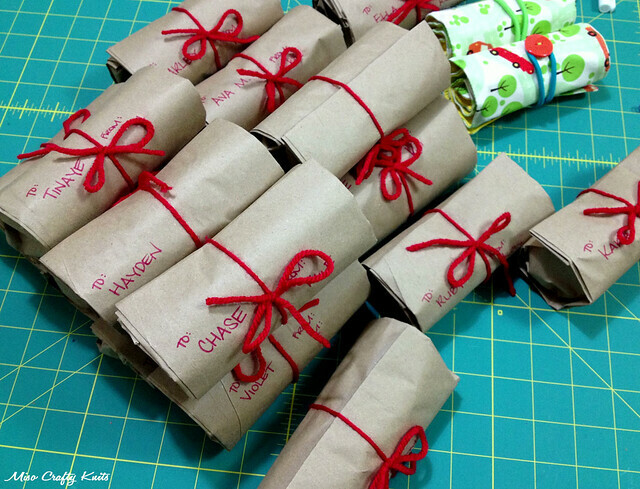 Before you know it, without the Munchkin asking, I decided to just make the entire preschool group a little gift. Yup...all 26 of them. I know what you're thinking - "are you eff'ing crazy???". Yeah...at the time, I didn't think so. I thought it would be a nice gesture. I mean, these are cutie patootie preschoolers who are getting all excited about Christmas, and I thought a little gift from a fellow friend would make their holidays a little happier. I mean, who doesn't like an unexpected gift?? I already knew what I was going to make - the exact same stocking stuffer that I had made the Munchkin, a simple (ha!) 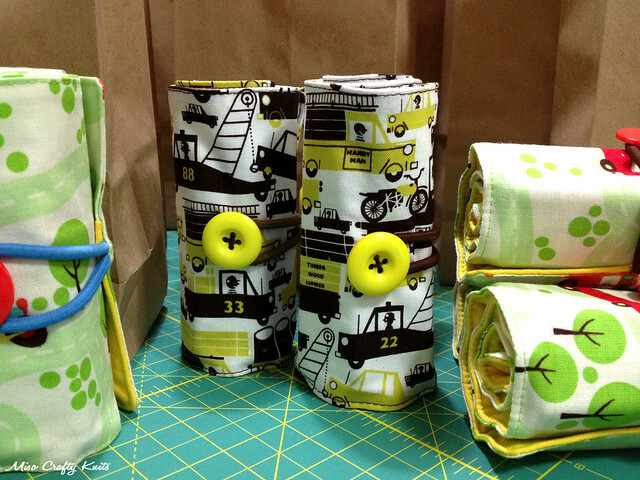 crayon roll. It took me about 10 minutes to make the Munchkin's, so this project shouldn't take too long. Right? Wrong. So, so very wrong! Here I was thinking that it would take me about 2, maybe 3 hours tops to make these rolls. Yeah, try 3 days of endless sewing and late, late nights. Holy moly. What...was...I...thinking?? Seriously, at one point I think I had crawled into a corner in the kitchen and started crying. But hey, I didn't have to buy anything other than the crayons, and I got to use up some of the fabrics in the stash that I didn't think I would get the chance to use up. It still amazes me as to why I had so many packages of hair elastics (oh yeah...cause the linen closet was a mess and every time I needed a hair tie, I couldn't find one and therefore would buy yet another package...not realizing I already had like, 4 packages hidden in the house somewhere!). The hardest part of this entire project? Trying to find enough packages of crayons! Everywhere I went, crayons were sold out!! Who would've thunk it, right? I ended up going to 4 different stores in total trying to gather up 28 boxes of at least a 16-count box of crayons. 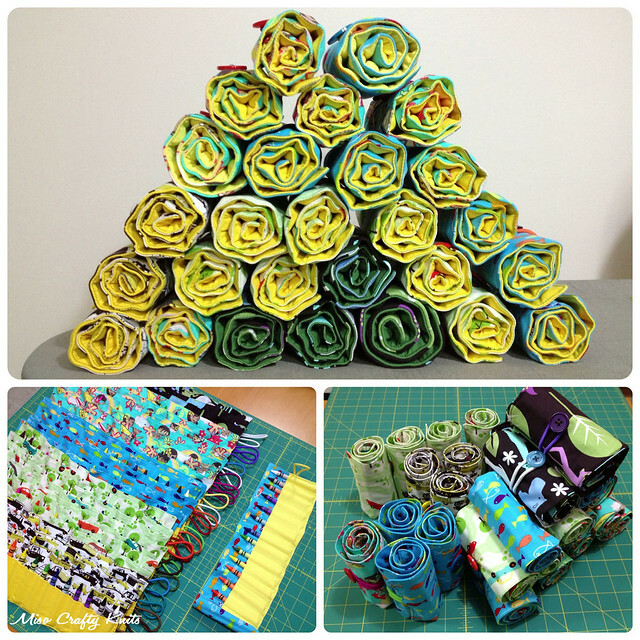 Oh yeah, did I mention that my insanity also had me make these rolls into a 16-count crayon roll? It did. If I was a sane person I would have made it somewhat easier on myself by making these rolls hold a mere 8 crayons. But no. I remembered when I was a kid obsessed with drawing that 8 crayons weren't enough. I was positive that the preschoolers of today would still feel the same way. I'm nuts I tell you. Nuts. The most fun part of this project? 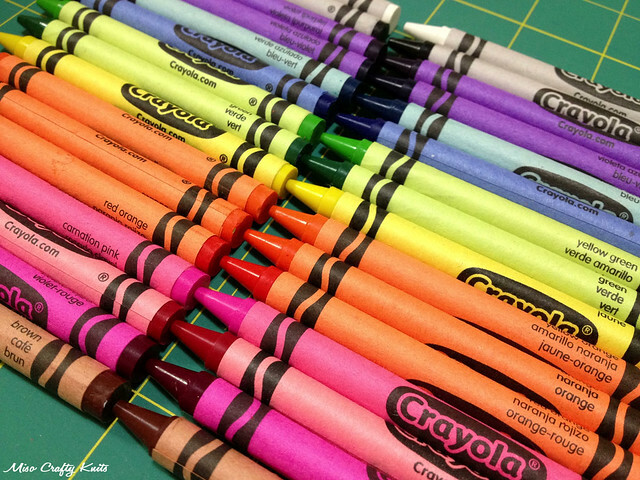 Arranging the crayons into a pleasing line up of colour. I realize that I'm a bit OCD in the fact that I must have everything in rainbow formation. Please tell me I'm not the only one! I'm not going to say how I made these, as there are a million and one tutorials out there and a quick Google-fu will get you some of the top tutorials in blogland. I didn't follow a specific tutorial either. At a glance you can pretty much tell what and how many pieces of fabric you need and the sequence of construction looks like a no-brainer too. I did, however, look up a bunch of tutes just to see what the consensus was on the dimensions of the standard roll. Although, while inserting what felt like a gazillion crayons into those slots, I thought I could have made the pocket piece a little on the shorter side. For some reason a part of me was paranoid about crayons falling out of the pockets, but now I'm thinking little ones might have an issue with nubby crayons being stuck in a slot. Oh well, nothing I can do about it now. I'll also admit that the first 5 rolls or so are probably the most shoddiest sewing jobs I have ever done. Brett tried to convince me that a bunch of 4 year olds weren't going to notice and that he highly doubted that the parents were going to scrutinize and compare rolls with the other parents. Bless his heart. I also decided to go the button and hair elastic route for the closure. As pretty as the ribbons may be, I had visions of kidlets yanking and tugging on the ribbon in a weird way and causing a knot to eventually form...and then a parent trying to un-knot the ribbon while cursing my name loudly in their heads as their wee one either complains away or loses interest in the craft at hand. Also, I don't know about you, but I don't know too many preschoolers that know how to tie up their shoelaces, let alone would be able to know to wrap the ribbons around the roll and tie it up. I know my Munchkin is all about being independent and doing things for himself (when he feels like it, that is), and pulling a thick elastic over a button would be much easier for him to do. Brett had asked about the safety of a button, but I assured him a 4 year old would know better by now not to put such things in their mouths. At least, back when I used to work as a children's tech designer I learned that 4 was the cut off year to not have to worry about choking hazards. Oh, and did I mention that yesterday I discovered that there was a new kid in the class? When I went to pick up the Munchkin I met the mother of the new kid, who was stressed out to the max cause it was his first week. 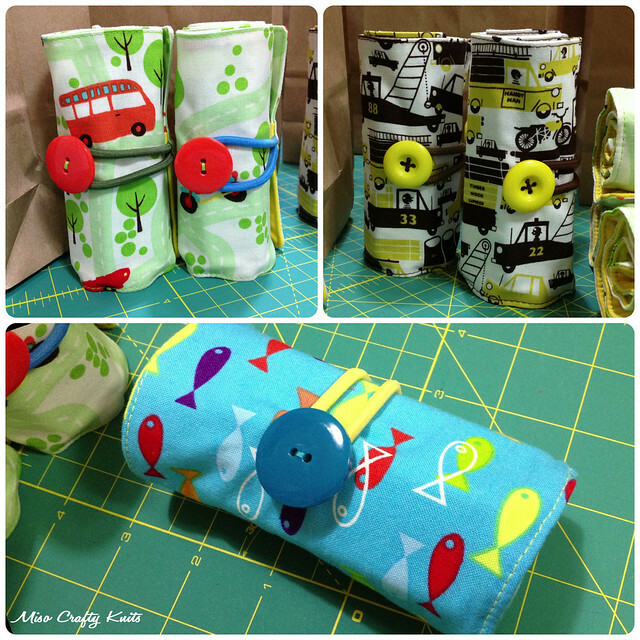 Lucky for me, I was smart enough to sew an extra roll. Cause you never know. And wow, am I glad I did! Could that adage be any more true? I never want anyone to feel left out, especially a little one, so for once my over preparation worked out and that new kid also got a crayon roll present. Phew! Luck truly does favour the prepared! 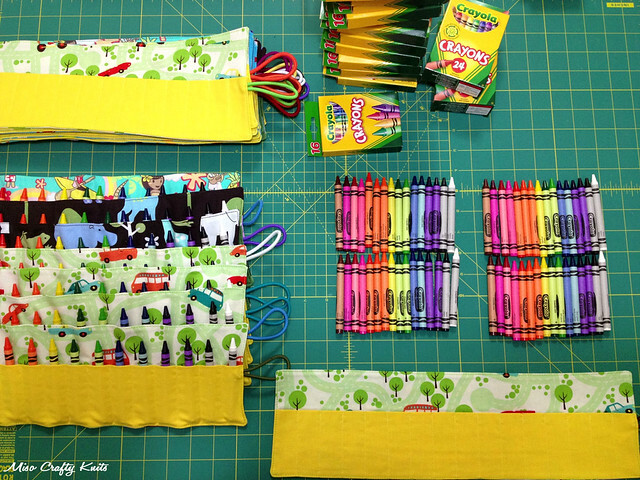 As I sat at my kitchen table at 3am this morning, arranging crayons, filling up pockets, sewing on buttons, and trying to wrap up each roll all assembly line style, I realized something: so many parents are going to think I have all the time in world to make these rolls, not knowing that I sacrificed precious sleep. Is any one going to appreciate these rolls? Will anyone value the fact that these little gifts weren't store bought? Then at 4am (yup...4...freakin...AM) I realized, I didn't care. All I cared about was that hopefully there will be 27 little kids happy and excited to receive a little gift to start out their winter holidays. That these 27 kidlets will have a chance during their time off from school to do a little drawing and colouring. That parents of 27 kids will maybe and hopefully get at least 5 minutes of peace and quiet as their child sets to work on a masterpiece. That 27 little kids will have a smile on their faces. And you know what? Those sleepless nights and all that hard work - all worth it for those little faces that lit up at the sight of their gift and the little smiles that followed. 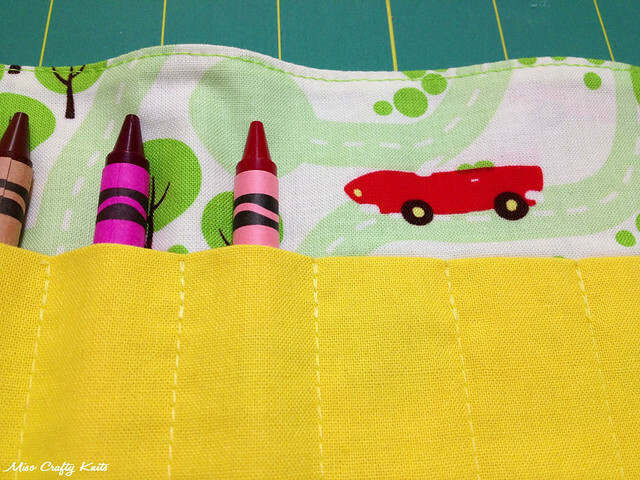 You are one superwoman and every child is going to love their crayon roll! Bravo!!!! I hope you can indulge in some well-deserved selfish crafting time over the holidays. Merry Christmas! Thanks Preeti! :) After the holidays I'm definitely going to take it easy on the crafting front for a bit and will most likely delve into some selfish crafting!! I hope you have a Merry Christmas too! Love the hair elastic idea too. Aw, thanks Nat! ♥ I can't wait to see Z's works of art!! You've just created the most amazing memories for your munchkin & all his friends! Merry Christmas!! You are the best! If I was a toddler, I would have been overjoyed!!!!! Not only was a surprise to get a gift, but such a thoughtful well put together gift! And so colourful!!!!!! I wish I was four again just for a minute, so I could get something as sweet as that! You deserve a break!